On the eve of affirming her late husband's prestigious legacy, Helen Alving strives to finally bury his long-festering secrets. The fiery desires of her estranged son, Oswald, drive all misdeeds into the light. 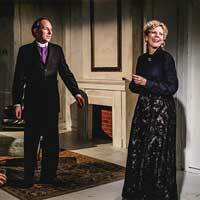 Relentless in its examination of the white feminist, Erin Murray's world premiere adaptation of Henrik Ibsen's masterpiece promises audiences the most incendiary Ghosts since 1882. It asks: are you devoted to a greater good...or just your own demise? "...By making the carpenter and maid black, the production attempts to make a 19th-century play more current, but it's unclear what era or country is being represented, so the added dimension of racial conflict seems misplaced. Perhaps the producers were hoping to evoke some eternal hell in which well-to-do white people dress in Old World garb and sweep their misdeeds under the finest rugs. I would've enjoyed seeing that play instead of watching this lot of vaguely wrought devils torment one another for no apparent reason and without even a trace of humor." "...It is difficult to adapt a classic play for young audiences, and when that play is Henrik Ibsen’s masterpiece “Ghosts”, it might seem impossible. A tip of my winter (brr it got cold) hat to Erin Murray on her new 100 minute version of this tale, now on the intimate stage of a Redtwist Theatre on Bryn Mawr. Those of you who know the space, know that it is the epitome of the “storefront” and for many of their productions, audience members feel as if they were in the play. After all, they are onstage." "...Ibsen was apparently unhappy with the English translation of the title as 'Ghosts.' A more literal translation of the Norwegian would be 'revenant' - literally that which returns. Given that the show is 136 years old, the fact that its themes about hypocrisy and society's expectations, particularly for women, feel so relevant today certainly evokes the image of a shambling zombie slowly but surely coming for us." "...Although Ghosts was his most controversial play within his lifetime, it was controversial for reasons that seem ridiculous today, in comparison to other of his works which still make audiences question themselves. The new adaptation by director Erin Murray refocuses attention on some of Ghosts’ deeper questions in a tight one-act."